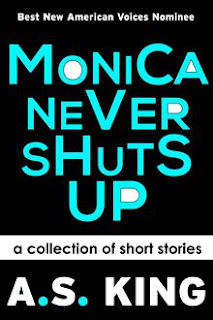 I think that I have sufficiently extolled my love for A.S. King's writing and admiration for her as a person previously on this blog...but then she released her new collection of short stories, Monica Never Shuts Up. And now I'm finding it hard to shut up about King. This collection has been advertised as King's first collection of stories "for adults" but really the fact that the majority of characters are adults is the only element that delineates these stories from King's novels for teenagers. To say that these stories have a wide range is an understatement. There really is a bit of everything in this collection, from contemporary stories to magical realism to soft science fiction. King isn't afraid to tackle big issues on new and interesting ways, and even her quiet stories are starkly funny and haunting. Even in her most (seemingly) innocuous tales, King seems to be gravitating towards and pushing boundaries, forcing her readers to think about the reasoning behind the choices we makes, how we deal with life's rough patches, and whether or not people have the capacity to change themselves. That same weirdness that we all know and love pervades these stories, and King's creativity and confidence make Monica Never Shuts Up a great pick for new and old readers alike. My favorite stories in the collection? "Monica Never Shuts Up," "Raul Shows Me Things," "Harry's Giant," and "Tests I Failed." Seriously, either get a paperback copy or download the e-book. This is an amazing collection.